It's the final 3 days before school ends and boy, are the kids feeling it. Every year they seem to get sick right when the school year is almost over - I guess it's a combination of excitement and being run down. Poor Sabrina, she had such a bad day at school - her throat has been sore for a few days - but we chalked it up to allergies. We have had so much wind the past few days you can feel the dust in your hair by the end of the day. Yuck. So when we picked them up yesterday, Sabrina could barely talk. We took her to the doctor, and it's not strep, but her throat is inflamed and raw. Alexander suggested a trip to Golden Spoon to make her feel better, but when she turned that down, I knew we were in trouble. 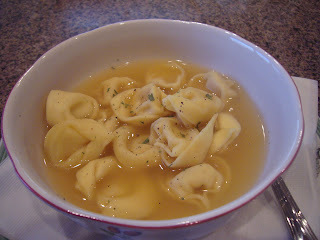 So in an effort to make her feel better, I threw together Tortellini En Brodo - or tortellini in broth. Pour broth into medium saucepan and bring to boil. Add tortellini and boil for 7 minutes, or until tortellini are cooked. Sprinkle with fresh ground pepper, pinch of parsley, and a little parmesan cheese. Serve with an extra hug.